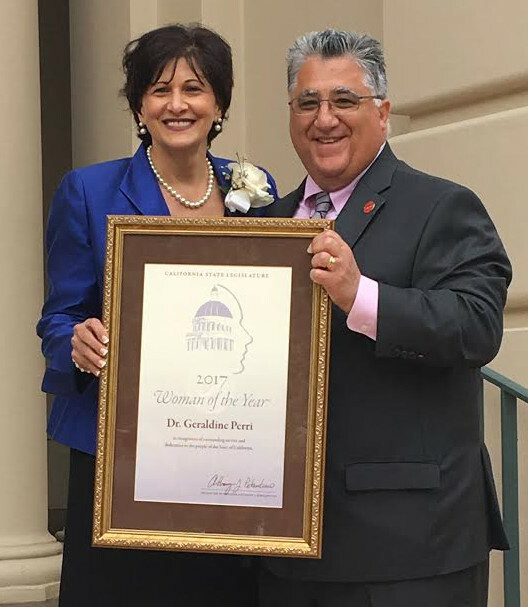 Dr. Geraldine M. Perri, superintendent/president of Citrus College, which serves Monrovia, has been named a "Woman of the Year" by State Senator Anthony Portantino. Perri was honored at a ceremony in Pasadena on March 26 where 10 women were recognized for their contributions and accomplishments within the 25th Senate District. "This year's Women of the Year of SD25 are each exceptional and unique in their advocacy to help others," said Senator Portantino. "They represent the best in the district and it is my privilege to recognize their successes." Dr. Perri was named Citrus College's superintendent/president in 2008 and has had a distinguished career in academia for over 30 years. "Dr. Perri was selected because of her outstanding leadership and commitment to student success," Senator Portantino said. "When we looked at what she has been able to accomplish at Citrus College, it was clear that Dr. Perri should be honored because she continues to advance the college's stellar reputation as a leader in higher education," Portantino said. As superintendent/president, Dr. Perri oversees a $71 million operating budget and serves the communities of Azusa, Claremont, Duarte, Glendora and Monrovia. "It was a truly an honor to be selected as a Woman of the Year," said Perri. After earning an associate degree in dental hygiene, a bachelor's degree in dental health education and a master's degree in health education, Dr. Perri earned an additional master's degree in organizational development and a doctorate in human and organizational development. Later, Dr. Perri completed Harvard University's Institute for Management and Leadership in Education and Cornell University's Community College Administrative Leadership Institute. "I am a product of a community college, and I believe in the transformative nature and power of our nation's community colleges," Perri said. "It is a privilege to be in a leadership role at Citrus College, a nationally recognized community college which is supported by a dedicated faculty, caring staff and a visionary Board of Trustees."